Gasoline-Pressure Washers . . . 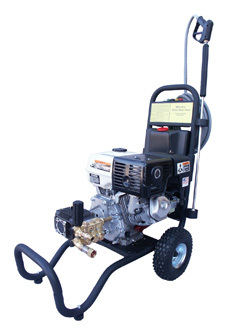 The GPW-2500 is a Commercial Machine with variable pressure. This machine is made for more control on cleaning heavy-duty deposits. It features a variable pressure (200-2500 psi) control valve for thorough cleaning, 6.5 hp motor, High Flow 3.2 gpm, a heavy duty frame with pneumatic tires. Our pumps have a 5-year warranty and have ceramic pistons. This is an excellent unit for heavy duty cleaning. * Industrial Pump - Rated for 2000hrs.